To learn more about this video please click here. WATCH IT ONLINE! “The presenter communicates the concepts clearly and she is very comfortable with them, which made for a professionally produced product compared to what is available elsewhere on this topic. The videos from others seem to be either filmed slide presentations or unscripted lecturers. You have a great product on your hands and I can’t wait to apply it within our business. 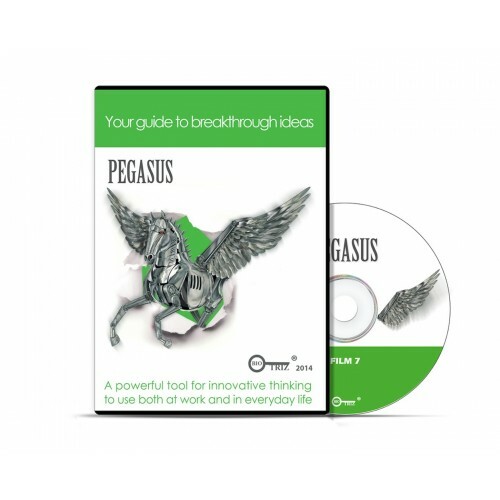 PEGASUS is a great innovation booster: you get breakthrough ideas on demand. DVD is full of visual examples, animations, impressive stories and case studies, which makes it fun for students and powerful aid for lecturers who teach innovation, creativity, TRIZ and LEAN. “Alphabet for Win-Win Solutions” is the seventh, the last video from PEGASUS series, but it can be used as stand-alone film, which describes 40 thinking patterns to spark creative thinking, instruction how to use them and illustrative case study. You may be surprised that a whole variety of solutions to any problem can be developed just by 40 general principles that sparkle breakthrough ideas. To find out which inventive principle resolves your challenge best, you need to use the Contradiction Matrix, which is also included in DVD as a pdf file.